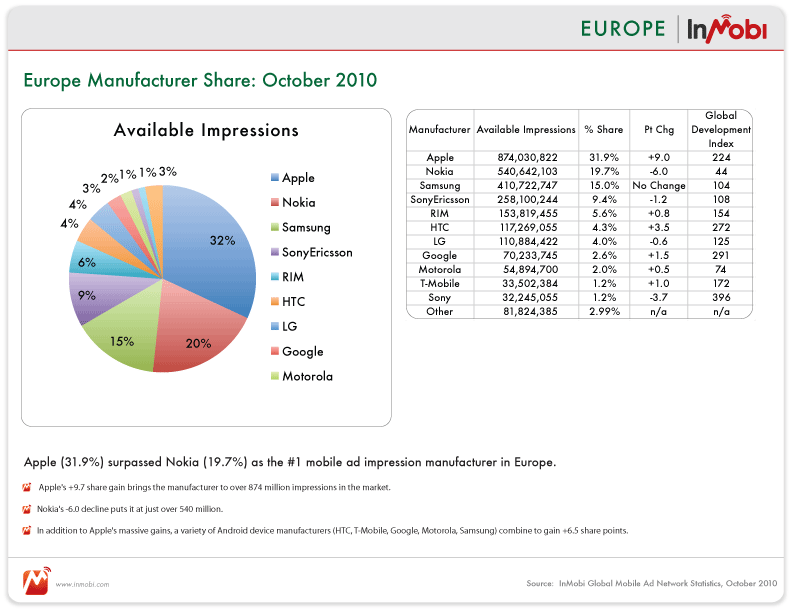 Starting with the U.S., we now see in our network the majority (57%) of ad impressions are now smart phone ads. In 2011, the distinction between smartphones and all the other phones will all but disappear. 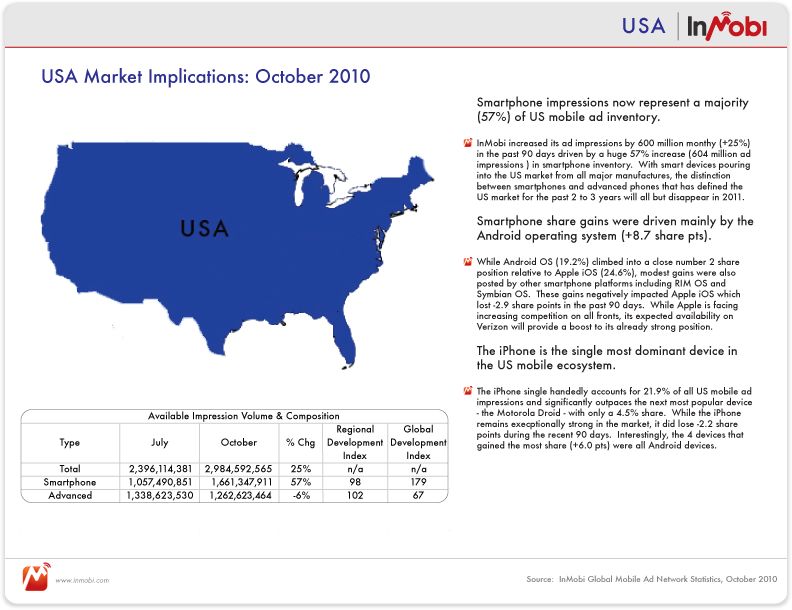 In the U.S., these gains were driven largely by the Android OS which increased +8.7 points. 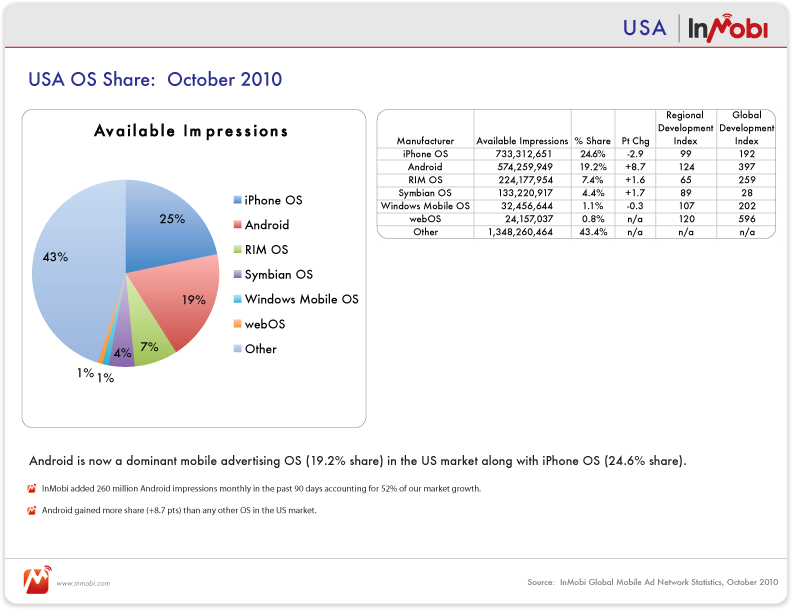 Current OS shares in the US can be seen below. Any previous objections to mobile advertising based on its ability to deliver compelling creative are simply no longer valid. While the iPhone remains the single most important device in the market, five of the top 10 devices in the US market are now Android devices. US datis leading indicator of the global change that will take place in the next few years. But with two different, yet complimentary, strategies unfolding; Apples closed approach versus Googles open platform. 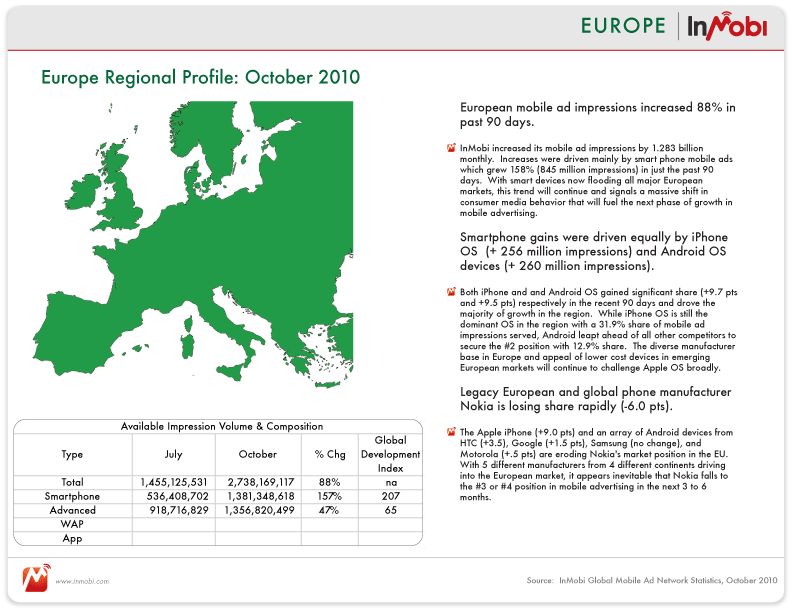 Moving to Europe, we see the iOS and the iPhone take the lead, now comprising over third (31.9%) of our network. 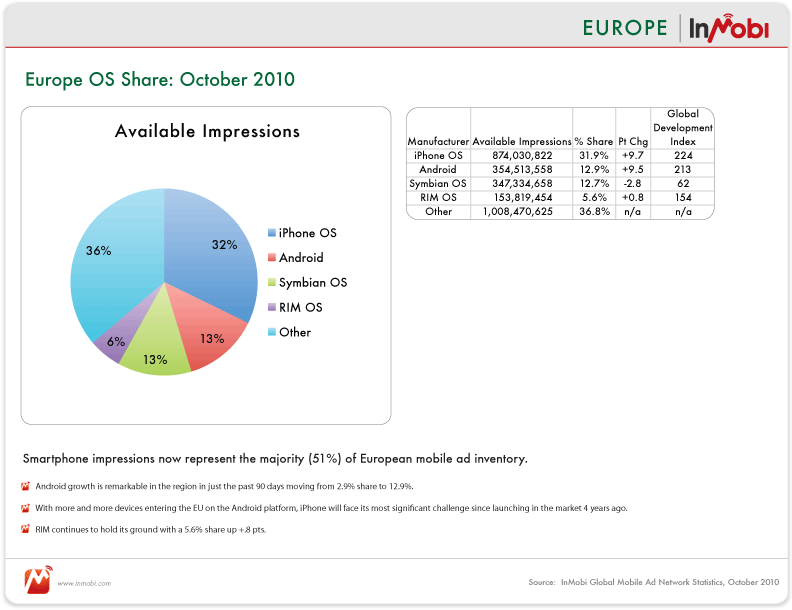 Android (12.9%) is now in the number two position. Almost overnight, the dominance of Nokicomes to an end. I will be the first to point out that our network is exaggerating this trend based on the success of our World Developer Program, but the trend is real and the conclusion accurate. With better devices and more compelling content becoming the norm in the U.S. and Europe, consumers are now well beyond œthe year of mobile advertising. Mobile advertising is now primary channel for reaching consumers. While advertisers are still learning about the benefits of the channel, consumers are charging ahead faster than ever. Their progress will force the issue in 2011. 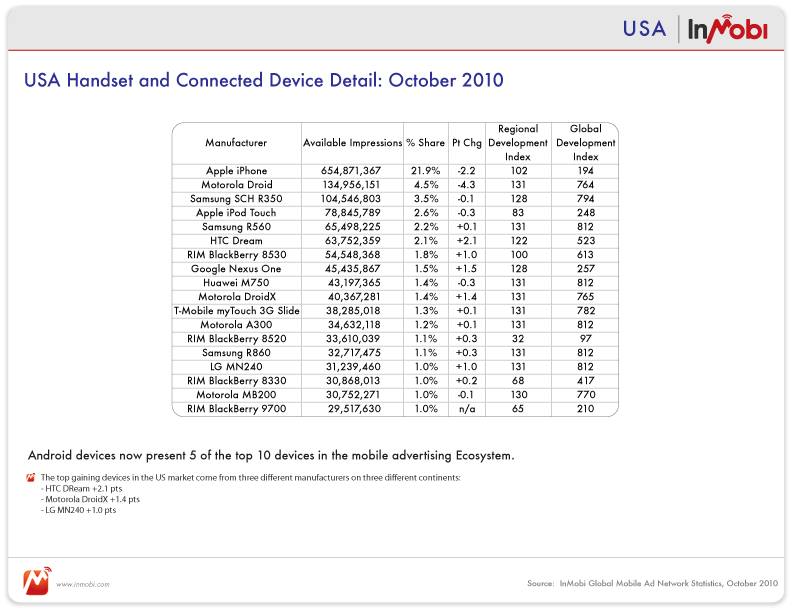 Over time, everyone will win - consumers, advertisers, Apple, Google, and even InMobi. So what do we call this next phase? Well reveal it after the Western New Year. Look for more 2011 predictions in January. As always, tweets, comments, and readership is welcome.